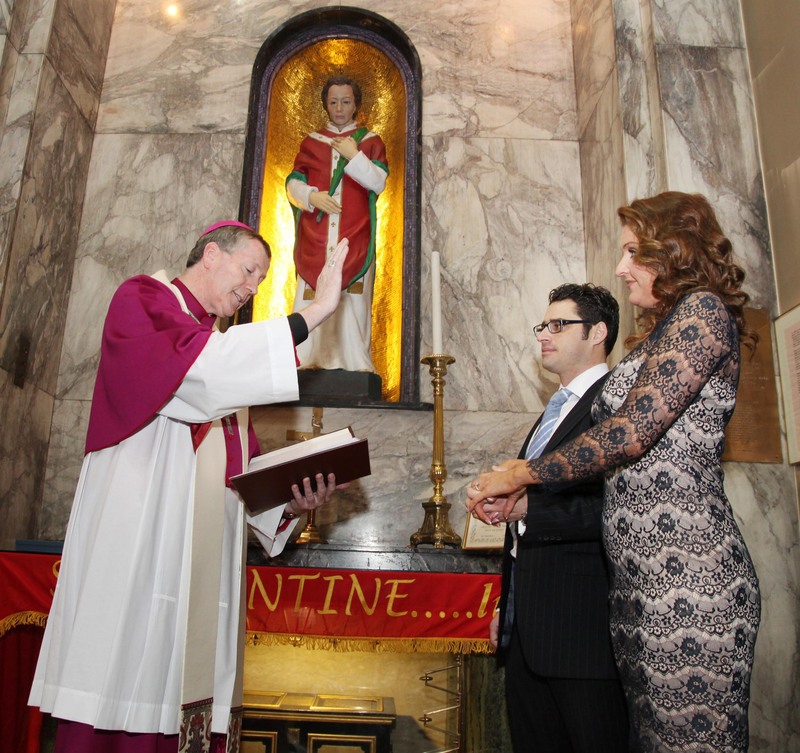 Bishop Denis Nulty, President of ACCORD, Catholic Marriage Care, blessed an engaged couple at the Shrine of Saint Valentine on Tuesday 10 February 2015. Bishop Nulty is pictured with the couple: Ms Leona Gallagher and Mr Paul McNulty. Leona is from Castledawson, Co Derry and Paul is from Beaumont, Dublin. The couple will be married in the Church of Ss Peter and Paul, Dunboyne, Co Meath, in the Diocese of Meath on 4 June 2016. Relics of Saint Valentine are interred in the Carmelite Church in Whitefriar Street, Dublin. Saint Valentine, a priest in ancient Rome, is regarded as the patron saint of couples in love, preparing for marriage and of married life. According to tradition, Saint Valentine was martyred on 14 February 250 AD. In 1836 relics that were exhumed from the catacombs of Saint Hippolytus on the Via Tiburtina, near Rome, were identified with Saint Valentine. These relics were placed in a casket, donated by Pope Gregory XVI, and transported to the Whitefriar Street Carmelite Church in Dublin.